Reigning champion Ronnie O'Sullivan and 2007 finalist Mark Selby advance to the semi-finals of the World Snooker Championship. 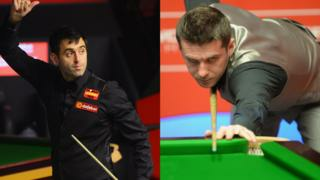 Five-time winner O'Sullivan remains on track to defend his title after he cruised to a 13-3 victory against 2005 champion Shaun Murphy. Selby only needed one frame of Wednesday's morning session to complete a 13-5 win over Alan McManus.